This is MBA project report on "recruitment & selection in Havells India Ltd." and this report is specifically for students studying Human Resource (HR). The objective of studying recruitment and selection is to identify the current physical requirement of industries & companies in the SIDCUL (state industrial development corporation of Uttrakhand limited). You can also Subscribe to FINAL YEAR PROJECT'S by Email for more such projects and seminar. 1. To study the scope of recruitment and selection in management at SIDCUL industrial area. 2. To learn about the sources of recruitment and selection which helps in meeting the requirement of different types of corporate agencies in Haridwar. 3. To study about the potential firms for recruitment and selection in management. This report starts with company introduction & its product and then comes to the main topic which is recruitment and selection. Recruitment refers to the overall process of attracting, selecting and appointing suitable candidates to a one or more jobs within an organisation, either permanent or temporary. Depending on the size and practices of the organization, recruitment may be undertaken in-house by managers, human resource generalists and/or recruitment specialists. The process of recruitment begins after manpower requirements are determined in terms of quality through job analysis and quantity through forecasting and planning. 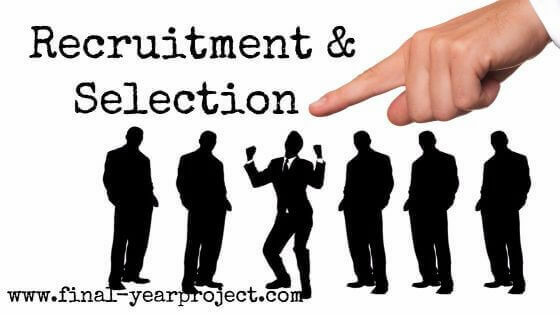 Whereas, selection process involves the hiring suitable candidates. It also helps to examine the applicants with regards to their suitability for the given jobs, choosing the best from the suitable candidates, to eliminate the possibility of prejudice on the part of the interviewer, etc. Recruitment and selection process happens in different phases, which has been discussed in this project. Use this report for your reference purpose only and thanks to the author of the project. Recruitment and selection process is very important. It helps in finding new and better employees. They used various of methods to find better employees.